Funny things, borders. As I cross into Poland, where I’ll be spending the next day and a half, I feel like I’m somewhere new, somewhere alien and exotic. But the birds and the bees above my head don’t see it that way; they just see more of the same. And the beetle scuttling across the path in front of me just sees more colossal pebbles and towering blades of grass to negotiate - although maybe he should be paying more attention to the bicycle tyres bearing down on him at speed. Oops, sorry Ringo! I was downstairs at the B&B on Sunday morning before the breakfast room was even open. As the girl brought in the food, Nina Simone was seductively singing “I Want a Little Sugar in My Bowl” on the stereo. I suspect the lyrics have a hidden meaning, but I took them at face value and loaded some extra honey in my tea. I was heading into the mountains today; I’d be needing all the energy I could get. I rolled north out of Trutnov, initially along the Úpa River then up to Stachelberg Fort, built in 1937-38 as part of the Czechoslovak border fortifications against Nazi Germany (the building work was halted by the annexation of the Sudetenland in October 1938; the Germans advanced so quickly the construction firm was forced to leave behind a lot of its equipment). From Stachelberg I hurtled down a steep forest trail then regained altitude on the road up to Žacléř. I took a short break in the village of Bobr (“Beaver”) just short of the border with Poland, near where the great Czech educator John Amos Comenius went into permanent exile in 1628. The hard work started just over the frontier. The road ramped up sharply through the village of Niedamirów and suddenly turned into a very rough track. An amused local started chatting to me as I ground to a halt. Unfortunately I speak barely a word of Polish, but I’m pretty certain I heard him say “crazy”. I struggled over that climb, rattled down the other side and joined the ER-2 cycle route, which I was to follow for much of the next two days. Things went from bad to worse. To begin with I missed a turn-off and had to backtrack down the hill. Then I found that a recent flash flood had turned the steepest section of the trail (which, with a grade of up to 33%, would not have been cyclable anyway) into a gully strewn with rocks, logs and other debris. Sucking on energy tablets, I variously pushed, pulled and carried my loaded bike up a 250 m ascent. This is supposed to be a bike path?! Morale hits a low point. At one badly marked fork in the path I temporarily abandoned my bike and scouted ahead. To my relief I soon emerged on a wider trail with a decent surface and better signposting. From there I was able to ride up to the highest point of my journey so far, just below a peak called Łysocina. The following rough-and-ready video captures the moment. There followed a 500 m descent to the outskirts of Kowary. Normally this would be a reason for great rejoicing, but my anger at Polish cycle-route planners soon turned to vexation at Czech cartographers, who were clearly having a laugh at my expense. Sections marked on my map as roads were in fact insanely bumpy trails. My bike was bucking like a bronco. At last I popped out - shaken and not a little stirred - on a blissfully smooth road leading up to the mountain resort of Karpacz. Karpacz is said to be the home of Liczyrzepa (aka Rübezahl in German and Krakonoš in Czech), the legendary guardian of the Giant Mountains, who also lends his name to the ER-2 cycle route. I can’t imagine he lives there any more. In fact, I bet he lives somewhere deep in the forest and grumbles about how Karpacz has gone to the dogs since he was a lad. It is a truly tacky holiday resort. I rode at snail’s pace into Karpacz in search of lunch. The place was full of fast food joints offering pizza and kebab. I chose one of the more salubrious-looking establishments and sat down at a table outside. The charmless waitress showed no interest in trying to communicate with a non-Polish speaker, so I pointed at random at a pizza on the menu. While waiting for it to arrive I checked my cycle computer and was disturbed to find that I’d only covered 51 km since breakfast. It was now almost four in the afternoon. I wolfed down the pizza (topped with ketchup and rancid cheese), had a quick coffee and left Karpacz as fast as I could - which was not very fast at all, because the road out of town kept rising and rising. At the top of the hill was a huge hotel, still under construction and grossly out of proportion with its surroundings. I don’t know what they put in that pizza, but it gave me a fair burst of energy. I clocked over 40 mph descending into Przesieka, then overshot my turning and had to ride back uphill. For the last hour or so I whizzed along a beautiful forest trail with a much better surface than I’d experienced earlier. I began to pass joggers and people walking their dogs, a sure sign that I was nearing civilisation again. I reached Szklarska Poręba at 6.15 pm - not too bad, all things considered. The hotel I’d booked - Hotel Agat - was bang in the middle of town. There was no store for my bike, but they had no problems with me taking it up to my room. After a quick look around the town (again pretty tacky, but less so than Karpacz) I dined in the hotel’s medieval banqueting room. 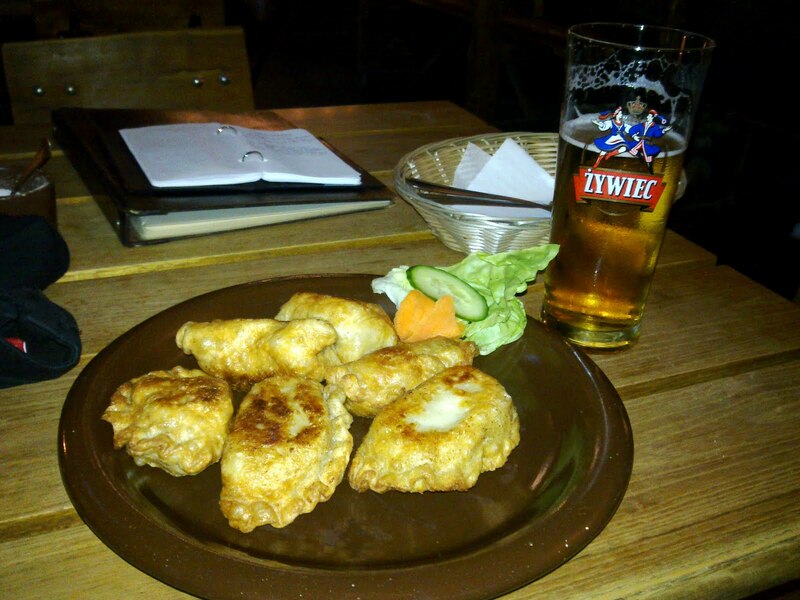 On the waiter’s advice I ordered pierogi ruskie - fried dumplings stuffed with a spicy cheese and potato mix. They were tasty enough, but stodgy and a bit boring. While writing a blog post on my mobile phone I realised I didn’t know how to spell “Szklarska”. I noted down my two best guesses on a piece of paper and asked the waiter which was the right one. Neither, as it turned out. He took my pen and wrote down the correct version for me. I took another stroll outside. Distorted music was blaring from a bar overlooking the river. It was all too much after such a hard day. Time for bed, I thought to myself as I walked past a life-sized model dinosaur, or I’ll be extinct myself by tomorrow morning.